Lately I've been obsessed with orange peel. It seems I can't eat an orange without first zesting or peeling it. I actually feel like I'd be throwing away some kind of valuable commodity if I threw away the peel. I know it's weird. I just really love the fresh smell of the oranges essential oils when zesting them. I used to just zest the peel over some waxed paper and save it in the freezer until I needed it for a recipe. But I realized that I wasn't getting all of the essential oils from the orange. So I started to make orange butter instead. By zesting the orange into room temperature butter, all of the oil is incorporated right into the butter. I mix it and wrap it in plastic wrap and refrigerate or freeze for future use. It also makes it easy the next time I need orange zest in a recipe, since the work is already done! In this recipe I made two different versions of bars. One with chocolate and the other is just topped with sliced almonds. They are both sure to please! 2. Mix together flour, baking powder and salt in a small bowl. 3. Beat together almond butter, butter and sugar in medium-size bowl until creamy. Beat in egg, yolk, rind and almond extract. 4. Stir flour mixture into butter mixture in 2 additions to form dough. If too soft, refrigerate to firm. 5. Place 1/2 of dough on a parchment lined baking sheet. 6. Stir chocolate pieces into remaining dough. Place on the same baking sheet. 7. Shape into two 10 x 3-inch logs. 8. 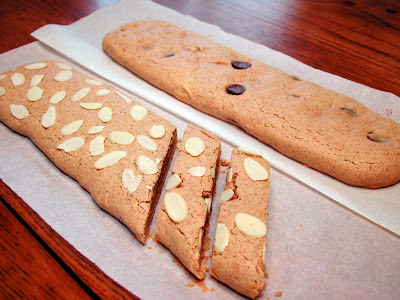 Top the first log with sliced almonds pushing gently into dough. 9. Bake in 375 degree F oven for 10 to 13 minutes or until lightly browned. Remove logs to cutting board. Let stand until cool enough to handle, about 10-15 minutes. 10. Using serrated knife, cut logs crosswise on a slight angle into 1/2-inch-thick slices. With spatula, transfer bars to wire rack to cool. 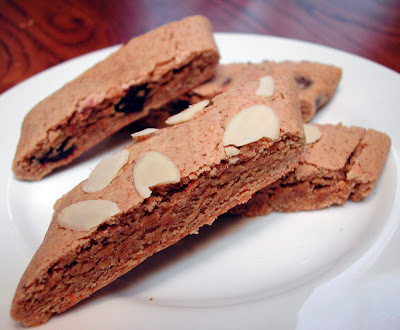 Yum, orange and almond bars sound great. I still haven't tried almond butter yet. The natural peanut butter tastes so much better than the kind with hydrogenated oil. I can never go back! I'm really starting to pay attention to oils, corn syrup, preservatives, etc. I'm not a big soda drinker in the first place, but I haven't had soda in a couple of months.